High levels of neuroticism are associated with increased thickness and reduced folding in some regions of the brain. 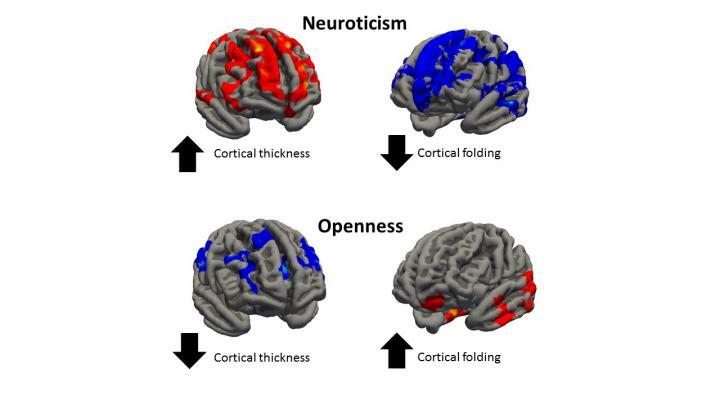 Openness is associated with reduced thickness and an increase in folding. Response: This is the first time the “big five” model for personality traits has been clearly linked to differences in brain shape. The findings of this study are significant for two main reasons. First, they allow better characterizing and understanding the relationships between personality and the brain structure in healthy people. Second, the relation between differences in brain structure and personality in healthy people suggests that brain changes may be even more pronounced in people with mental illnesses. Linking the brain structure to basic personality traits is a crucial step to improving our understanding of mental and personality disorders. It may give us the opportunity to detect those who are at high risk of developing mental illnesses early, which has obvious implications for prompt intervention. Response: As a result of the study we found an association between individual differences in personality and some key structural features of our brain. However, we can’t say anything about the causal relationship between the two phenomena. So, we can’t say if we have a specific personality type because our brain has a specific shape or whether the shape of our brain determines our personality. Let’s remember that the shape of our brain is also influenced by genetic and environmental factors. As we go along with age, our brain structure is modified by maturation and physiological aging. At the same time, as we age, we learn how to deal with emotions and become more conscientiousness and agreeableness and less neurotic. Therefore, the next step will be to run studies that follow up people from young ages, to understand how their genes and environment they are brought up in affect their brain maturation and personality. Response: The new data presented in this study provided the most robust evidence to date on the neuro-anatomical substrate of the five fundamental dimensions of human personality. Hopefully, further studies simultaneously assessing multiple indices of brain structure and function will be able to extend our work and reveal in more detail the complexity of the neural circuits underlying individual differences in personality. This entry was posted in Author Interviews, Mental Health Research, Neurological Disorders, Psychological Science and tagged brain science, personality by Marie Benz MD FAAD. Bookmark the permalink.